Roots adventitious, arising from nodes. 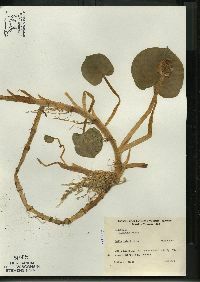 Rhizomes creeping at or near surface, elongate, 1--3 cm diam. 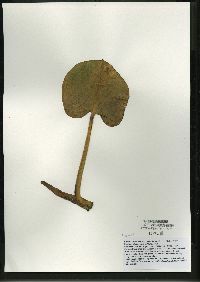 Leaves: petiole 6--30(--40) cm; blade 4--14 cm wide; lateral veins curved-ascending, parallel. 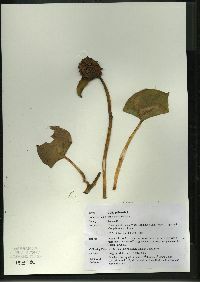 Inflorescences: spathe ovate to elliptic, 3--6(--8) cm, apex long-apiculate, 4--10 mm; spadix on thick short stipe, cylindric, shorter than spathe, apex rounded. Flowers covering spadix; stamens (6--)9--12, of 2 types, outer with broad filaments and inner with narrow filaments; ovaries 1-locular; ovules 6--9, anatropous. Infructescences 2--5 ´ 1.5--3.5 cm. Fruits pear-shaped, 6--12 ´ 5--10 mm. Seeds brown with dark spots at chalazal end, cylindric, 3--5 mm. 2n = 36. Flowering late spring--summer. Bogs, marshes, wooded swamps, and marshy shores of rivers, ponds, and lakes; 0--900 m; Alta., B.C, Man., N.B., Nfld. and Labr., N.W.T., N.S., Nunavut, Ont., P.E.I., Que., Sask., Yukon; Alaska, Conn., Ill., Ind., Maine, Md., Mass., Mich., Minn., N.H., N.J., N.Y., N.Dak., Ohio, Pa., R.I., Vt., Wis.; Eurasia. 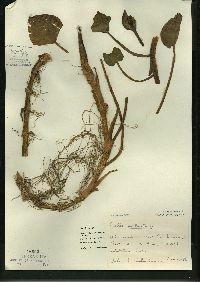 Plants with two or three spathes per inflorescence occur; this anomaly is recognized as C. palustris forma polyspathacea Victorin & Rousseau. 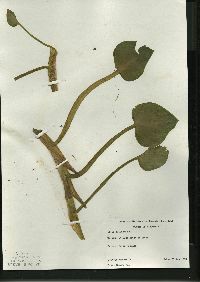 Calla palustris has been reported from Iowa (T. G. Lammers and A. G. van der Valk 1979), but the only specimen is an unreliable record. 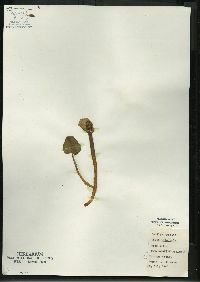 The species was also reported from Mendocino County., California (A. Eastwood 1900), but the specimen on which this record is based was destroyed (H. L. Mason 1957). 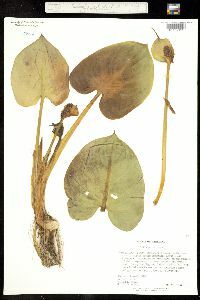 Perhaps this collection was an incorrect identification of Zantedeschia aethiopica, the cultivated calla-lily, which has escaped and naturalized in areas along the California coast (see table 203.1). Preliminary field studies indicate that species of syrphid flies (Sphegina spp., Diptera: Syrphidae: Milesiinae) are especially common on inflorescences, with occasional visits from the widespread flower fly, Toxomerus geminatus (Diptera: Syrphidae: Syrphinae) (S. A. Thompson 1995). Flour can be made from the seeds (M. L. Fernald and A. C. Kinsey et al. 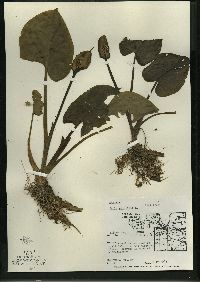 1958), and plants are sometimes sold in aquatic garden catalogs for ornamental plantings in bog gardens. Perennial herb 10 - 30 cm tall Leaves: with a stout stalk 6 - 30 cm long, 4 - 15 cm long, egg-shaped to nearly rounded with a heart-shaped base and a pointed tip, veins curved-ascending and parallel. Inflorescence: of many tiny flowers borne tightly clustered along a spike with a very fleshy axis (spadix), with male flowers above female flowers, some flowers also bisexual. The cylindric spadix is 1.5 - 2.5 cm long with a rounded tip and is surrounded by a white leaf-like sheath (spathe). Spathe egg-shaped to elliptic, reaching 3 - 6 cm long with a 4 - 10 mm long tip that rolls inward. Fruit: a cluster of red berries, each pear-shaped berry reaching 6 - 12 mm long, containing four to nine seeds surrounded by gelatinous material. 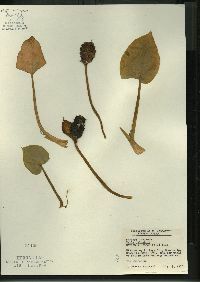 The cylindric seeds are brown with dark spots at the base and 3 - 5 mm long. Similar species: Calla palustris, Peltandra virginica, Symplocarpus foetidus all have simple leaves and flowers covering most or all of the spadix. 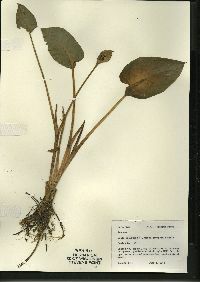 Peltandra virginica has a green spathe and large (to 0.57 m) arrowhead-shaped leaves with basal lobes. 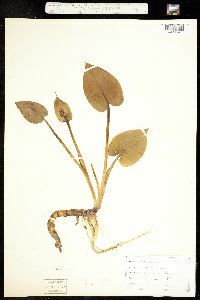 Symplocarpus foetidus has a green to purplish (often spotted or striped) spathe and large (to 0.6 m long) oblong to egg-shaped leaves. 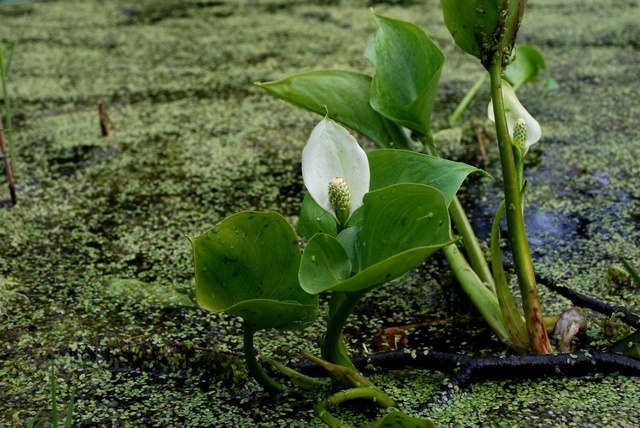 Habitat and ecology: Rare in bogs and wet soil. Etymology: Calla comes from the Greek word kalos, meaning beautiful. Palustris means marsh-loving. This species still occurs in La Porte County in a decadent tamarack bog about six miles west of La Porte and in Noble County in sec. 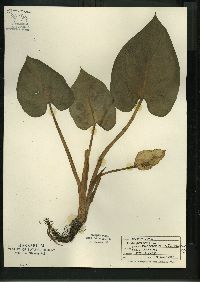 12 of Washington Township where it is found in mucky soil among Cephalanthus on the border of a Chamaedaphne bog. It was reported from two places in Noble County by Van Order but at both of these stations the habitat has been destroyed by drainage. It was reported in 1913 from La Porte and St. Joseph Counties by Nieuwland, who later told me that the St. Joseph County report was an error. 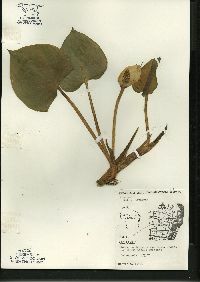 Peattie reported it on the authority of Nieuwland as found at Tamarack Station in Porter County, but I have not seen a specimen. 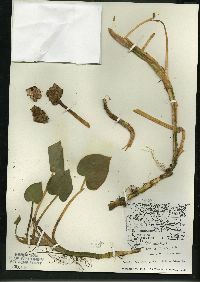 There is no specimen from Porter County in the herbarium of the University of Notre Dame. Fls all perfect, or the upper staminate, covering the spadix; spathe expanded, not enclosing the spadix, ovate to elliptic; perianth none; stamens 6; filaments narrow, flat; anthers short and broad; ovary unilocular, with several erect anatropous ovules; fr a red berry, the few seeds surrounded by gelatinous material; perennial herbs with petioled basal lvs and solitary spathes. Monotypic.